This is the 7th burn of Binance Coin (BNB), for the period between January 1 to March 31, 2019. 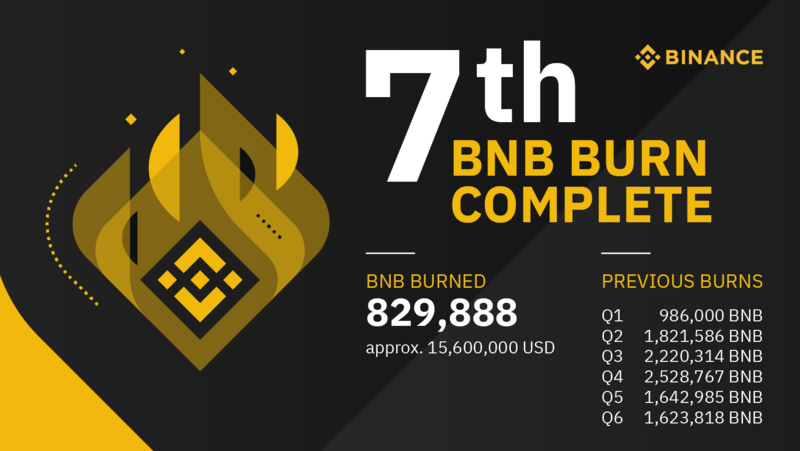 We, at Binance, are burning 829,888 BNB, which is roughly equivalent to US$15,600,000. If you’d like to know why we burn BNB, or learn what a “coin burn” is, then please watch Binance Academy’s short explainer video here. A few points here to take note of: First, with the rise in the price of BNB, the burning rate will become slower, assuming all other things stay constant. This is by design and we were aware of this dynamic effect back in the whitepaper days. Second, the price of BNB began to rise before BTC even began to turn around in the market a couple months ago. This means fewer BNB were spent on trading fees by our users, resulting in lower revenue in BNB, while our revenue denominated in USD rose during this time. Third, with the recent rise in BTC price, we see our revenues in USD terms making a turnaround, too (rising). Well, I don’t really know. Our mantra has been quite simple, to keep our heads down and focus on building. We kept building all throughout 2018, and 2019. I think that’s really it. We build products that people use and we never stop trying to improve ourselves and our products. Price will eventually catch up to the value you create. Timing-wise, the BitTorrent (BTT) Launchpad sale was a turning point for BTC. The super successful sale of BTT restored a level of confidence in the market and reactivated interest in token projects. I could be wrong, maybe the market just bottomed out as the sellers were done. You can also read more about the shift in correlations between BTC and other large-cap cryptoassets in this Binance Research report. As you probably know, we brought Launchpad back to life in Q1 of this year, at the bottom of the “bear market”. There were some risks in this decision; I will explain why we did it. Our goal has always been to help good projects grow. This is important because, as more and more solid projects grow, our industry will see newer heights and become stronger at the core, which in turn will be better for everyone in the ecosystem, including ourselves. We help projects raise awareness, by providing them with a platform to reach millions of potential investors and users across the globe. In our blockchain world, early investors often become first future users. Launchpad helps projects raise these important users to fuel the scalability of their projects. I would argue this is more important than raising funds. People trust Binance. To protect investors, we conduct robust due diligence on tokens, projects, and teams when selecting projects for Launchpad. To ensure we bring credible and trustworthy projects to the ecosystem, each Launchpad project is screened through a rigorous selection process. In a traditional VC setting, the project teams and founders would have to spend large amounts of time and energy dealing with VCs, pitch decks, board meetings, etc. With Launchpad, they can focus on building their product, and we help take care of the rest. Launchpad is not a platform for you to 3x, 5x, or 10x your money in a matter of days. This is not the intended design of Launchpad; it is merely an effect of the market overreacting, this time on the positive side. We built Launchpad because we believe fundraising on blockchain is one of the best tools for entrepreneurs. We do advise projects to keep their valuations low at the sale to give users more benefits, but projects don’t increase in value 10x overnight. They need to build out their products and services over time. For this reason, we highly recommend you only invest in projects you understand and are willing to hold for the long term. Decentralized exchanges (DEX) are a potential disruptor for the centralized exchange business, but we believe strongly in innovation and pushing the industry forward. One key difference/advantage in a DEX is that you no longer need to hold your funds with the exchange. You control your own funds. We believe this is an important step for the evolution of our industry. In Q1, we launched the Binance Chain testnet, as well as the Binance DEX running on top of it. We ran a large number of tests, including a simulated trading competition and DEX coding competition (ends April 30) with real money rewards. The results and feedback have been very positive. This has allowed us to launch the mainnet in April with confidence. With 1 second confirmations, Binance DEX also increases the utility of BNB. Let’s see what happens when the mainnet launches. Today, most of the money is still in fiat. To that end, we have increased our offerings on our fiat gateways. We have reduced fees significantly for Binance.JE, which now has the lowest fees of all fiat exchanges in the world. If you want to trade Euro (EUR) and British Pound (GBP) with BTC or ETH, give Binance.JE a try. We also made significant progress in Singapore, with the imminent launch of Binance Singapore in April as well. We hope this will be a booster for the blockchain industry in Asia. 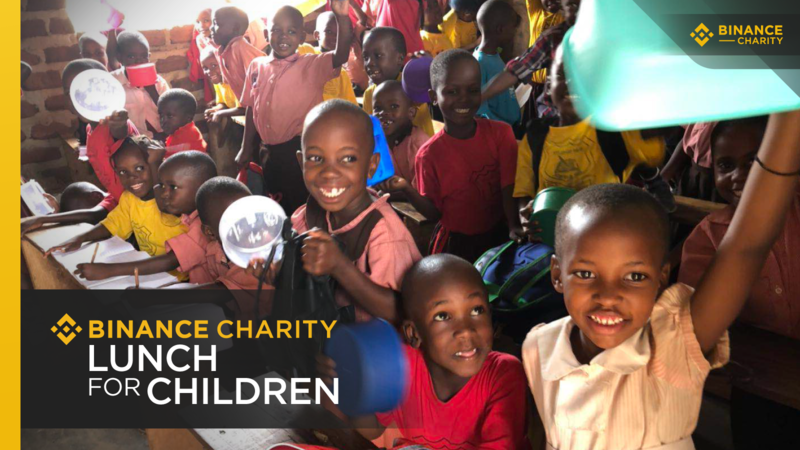 Last but not least, we’ve helped to put 2,157 children back in school by providing them with lunch, with an additional 1,590 students to join the Binance Lunch for Children program starting in May. Thanks to the rise in BNB price, with just 1 BNB, you can now ensure lunch for a child for an entire semester (3 months). And, you can track your donations on the blockchain on Binance.Charity, from your wallet all the way to the school and child. With this level of transparency, making a donation feels greatly satisfying, and rewarding. Give it a try at www.binance.charity. Thank you for your support, as always!